With all the ​different types of ​tomatoes​ available today it’s hard to know where to begin. Read on to find out which plants are best for you! Tomatoes come in about every color from white to purple, pink, yellow, orange, mottled, or, yes, striped. (No polka-dots.) Commonly grown varieties include Beefsteak, Big Boy, Brandywine and Boxcar Willie, to touch only on the Bs. Other cultivars include the suggestively named Mortgage Lifter, an heirloom variety popular during the 30s, and Purple Haze, a large cherry tomato derived from Cherokee Purple, Brandywine and Black Cherry. How to decide what to plant? When you choose what tomato type you want to plant in your garden, you’ll probably base your decision on at least three criteria: personal preferences (for shape, size, and use), disease resistance, and climate. (Hint: a good plant for someone in Arizona probably isn’t ideal for Maine.) 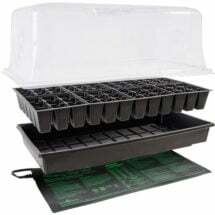 Then, you’ll need to decide how many tomatoes to plant, and finally, assuming that you’re not starting from seeds, you’ll need guidelines for selecting seedlings from amongst dozens competing for your attention. This is a lot of information, so we’ve put together a quickie version. Using the right gardening products makes growing organically easier, more successful and enjoyable! 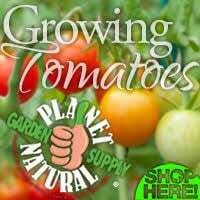 At Planet Natural we stock everything you need​ ​– seeds, soils and fertilizers — ​to make your tomato garden the envy of the neighborhood! If you’re just starting out, we’d recommend that you experiment with at least three different tomato varieties. That way, you can see what they are like to grow and what tastes best. Go to a reputable nursery or greenhouse near you at the beginning of the growing season. 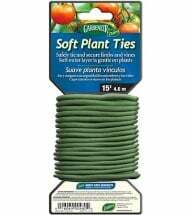 You may find precisely what you need at an over-hyped box store garden outlet, but your chances of speaking with someone knowledgeable go up if you go to a real nursery or gardening store. So do your chances of bringing home disease-free seedlings. Get someone who works there to tell you about the tomatoes they sell. Be sure to share any pertinent information about your own needs and garden (and gardening) limitations. Buy several likely candidates (a few more than you’ll need, since one or two always keel over or fade away for no clear reason.) Then proceed to the How to Plant Tomatoes page. Say goodbye to blossom end rot! 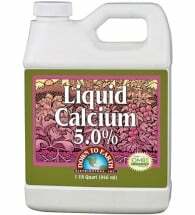 Down to Earth® Liquid Calcium contains 5% calcium to correct nutrient deficiencies and strengthen plant cell walls. OMRI Listed for use in organic production. 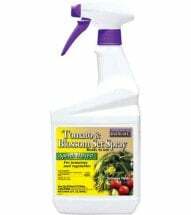 If you’re new to the world of tomato gardening, and a nursery worker blithely recommends over her shoulder that you select a determinate hybrid, you may feel even more helpless than you did before you asked the question. It helps to know a little about tomatoes, how they grow, and how they’re categorized, so that the language on the back of seed packets or coming out of a gardener’s mouth doesn’t seem like pure gobbledygook. Here, then, is an introduction to two of the most basic distinctions: determinate vs. indeterminate, and heirloom vs. hybrid. Determinate/ Indeterminate: Determinate tomatoes bloom and set fruit all at once and then decline. Their blossoms grow at the ends of shoots, thus stopping growth and determining their length. These varieties are usually compact plants which require no pruning and little staking, the exception being “vigorous” determinants, which produce such large fruit that they do need support. Indeterminate tomatoes are in it for the long haul. They continue to grow and to produce tomatoes throughout the summer, because the flowers grow along the vines rather than at the ends. Since they don’t come to a determined point but grow until stopped by cold weather or a pair of clippers (hence their name), they generally need to be supported or pruned. Restore one of summer’s greatest pleasures by growing heirloom tomato seeds from Planet Natural. Fresh sliced, canned, or made into sauces, they’re so much sweeter, juicier and extra flavorful than any commercially-raised tomatoes. Just about any tomato outside the wild varieties remaining in Central and South America has been bred — its pollination and reproduction controlled — to promote certain specific qualities. The difference between hybrid and heirloom varieties lies in how recently the variety has been crossed with others, and therefore how reliably their seeds will reproduce the plant on which they grow. Heirloom tomatoes were developed over many years and many generations, by the old-fashioned method of growing tomatoes from seeds with desirable qualities, keeping the seedlings that retain those desired qualities and tossing those that don’t. Gradually, the line was refined; more and more of the seeds produced plants with the desired characteristics, until finally aberrant and undesirable qualities were bred out of the strain. One of the keys to heirlooms is that they have been developed through open-pollination over many years. Their key, defining qualities are therefore encoded in dominant genes, which will win out over competing, cross-pollinated varieties, at least for a while. If you’re growing them beside other tomato varieties, cross-pollination will eventually lead to changes in seeds, but seeds from heirloom plants, grown in relative isolation from others, will breed true. How old a variety needs to be to count as an heirloom is a matter of opinion. Some gardeners only recognize varieties that are more than 100 years old. Others accept cultivars that pre-date 1945. Hybrids, a more recent development, are the result of forced cross-pollination between two different varieties (see What are Hybrid Seeds). There is no attempt to develop a seed “line” for a hybrid; it is produced anew each year, always by crossing the same two varieties. Tomatoes generally self-pollinate, the (male) pollen in the flower fertilizing the (female) stigma, often with the help of bees or wind. (There’s actually more to it than that, but that’s enough for the moment.) Occasionally cross-pollination occurs when one of those helpers brings pollen from a different variety to the flower (see Pollination in the Garden). Developed by the U.S. Department of Agriculture, red tomato mulch has been tested to show on average a 20% increase in fruit yield. 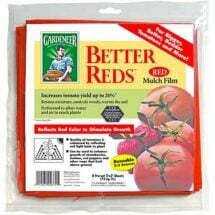 Better Reds Tomato Mulch does this by reflecting a specific range of light frequencies found in sunlight up into the undersides of your crop’s leaves and to the developing fruit. In hybrids, that natural process (open pollination) is pre-empted by manual pollination, where pollen from one variety is used to fertilize flowers of the other variety. That cross-pollination occurs in the generation just before the one you’re buying (or growing). The “parents” of the hybrid tomato plant, in other words, are two very different types, and the seeds from the hybrid contain DNA for both, in all kinds of combinations. Therefore, you cannot count on those seeds to produce a plant genetically identical to the mother plant; you simply can’t know which of the two “parents” contributed the gene for size, or for firmness, or for skin toughness, in any particular seed. Furthermore, what gives the variety its distinctive qualities (size, color, taste, firmness) is sometimes encoded in a recessive, rather than a dominant gene, so open pollination in your garden may “contaminate” the seeds with some other, dominant, gene. Heirloom or Hybrid: Tomato hybridization, which took off after WWII, has produced varieties much more resistant to diseases than heirlooms, but anyone who remembers how tomatoes (or peaches) tasted as recently as the 1960s or 70s knows that one of the main qualities for which they’ve been bred is toughness, rather than flavor. Like so many other fruits and vegetables, tomatoes used to be a local product, but in this era of mass transportation, they are bred largely to survive the trip to the supermarket. 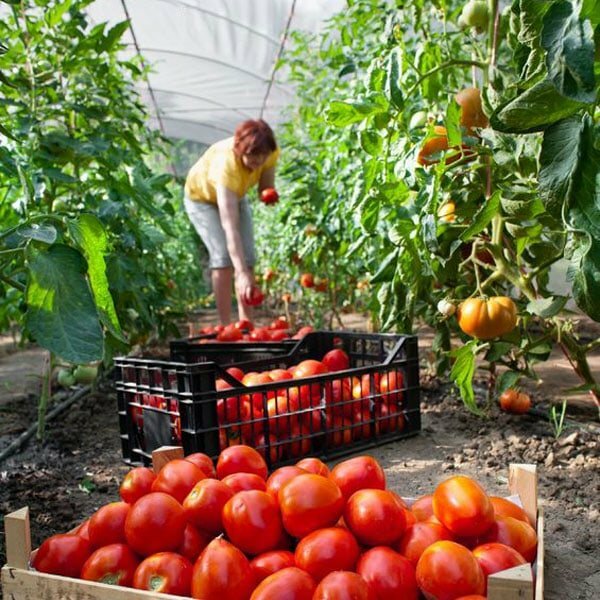 That trip, and the stress on the modern tomato, actually begins way before an eighteen-wheeler enters the picture, for many field tomatoes are picked and sorted by machine. While the industrial tomato has no doubt done wonders for produce shipping and supermarkets, and while it has made tomatoes available all over the country throughout the year, taste has suffered, which is why many home gardeners prefer heirloom varieties (see Why You’ll Always Have to Grow Tomatoes). If you need disease-resistance, use hybrids, since most disease-resistant varieties have been developed since 1945 as hybrids. If you want to use seedlings from your local supermarket or nursery, you’ll probably have hybrids. If you want standard round, red tomatoes or cherry-tomatoes, hybrids are fine. If you want to be able to plant seeds from the tomatoes you grow and get a plant just like the one you started with, use heirlooms. If you want tomatoes like the ones Grandma grew, use heirlooms. If you want weird, wonderful, really different tomatoes — purple or pink tomatoes for instance — you’ll only find this kind of variety amongst the heirlooms. If you want the very best in flavor, many gardeners swear by heirlooms. Fruit Size, Shape and Use: What do you want to do with your tomatoes? Do you want tomatoes for shish kabob or for hamburgers? For tomato sauce or for salads? 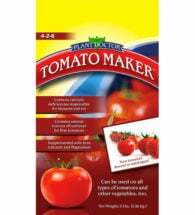 The use will to some extent determine the variety of tomato you want to grow. For shish kabob, the small cherry, grape, or pear tomatoes work well, while chunks of larger tomatoes would probably be a disaster. But if you want a nice, big, thin slice of tomato to grace your hamburger, you want to grow large slicing tomatoes. For sauces, you can of course use anything, but the juiciness we prize in a salad tomato can lead to a runny, watery sauce. This is where paste tomatoes (such as Romas) come into their own, yielding a thick, hearty sauce. For salads, flavor is paramount. Tomatoes come in all sorts of shapes and sizes. Cherry tomatoes, grape tomatoes, pear tomatoes, etc. tend to be sweet and easy to grow. 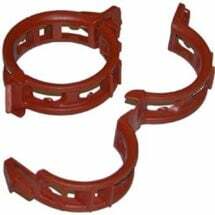 They take less time since they are smaller, so they can work well for gardeners with short growing seasons. They also tend to be disease resistant. Jump start your plants with the Hydrofarm Hot House. Offers increased growing success by providing gentle heat to the root zone and by controlling humidity under the dome. Easy to use — just add your own starter mix! There are hundreds of kinds of slicing tomatoes, including the big gun of the tomato world, the Beefsteak. Because classic red slicers tend to be big and bulky, each plant will bear fewer fruits, but each tomato will be bigger. They range in color from a deep red to yellow and even somewhat pink. The deep red tomatoes have the most intense flavor. Yellow tomatoes tend to be milder and pink ones are mild and sweet. Paste tomatoes have smaller seed cavities and are denser than slicers and cherries. They are best used in cooking — for sauces, stuffed tomatoes, etc, since they are less juicy than table tomatoes. Plant Size: Everything from soil, moisture, and sun exposure will affect the growth of a tomato plant, and of course pruning can significantly affect how tall and how bushy plants will get. Nevertheless, different varieties do have a genetic pre-disposition to reach a certain height. Indeterminates easily reach five feet in height (the record is around thirty), while determinants generally cap out at about three feet. There are also a number of dwarf varieties especially bred for containers; these are usually between twelve and eighteen inches high. Fruit Development: Determinate and Indeterminate, Early or Late Starters: Another set of choices has to do with whether you want your tomatoes early in the season or late, and whether you want them to produce their fruit all at once or throughout the growing season. As mentioned above, determinates tend to produce fruit all at one time, and usually fairly early in the season. Indeterminates, on the other hand, generally grow larger, and can take longer simply to get underway. Three factors, then, will probably affect your choice of determinate or indeterminate varieties. The first of these is whether you want your fruit all at once or throughout the summer, and the second, whether you are ready to supply support for your tomatoes or want self-supporting varieties. The third factor is simply size; as mentioned above, determinates simply tend to be smaller than indeterminates. An early starter produces fruit early in the season; a late starter takes its time. Think of them as early and late maturers. This distinction interacts with climate in affecting your selection process: if your area has a short growing season, for instance, late starters are a poor bet, unless you’re burdened with an obscure masochistic tendency or blessed with a greenhouse. Your own gardening style may also affect your preference for early or late starters. 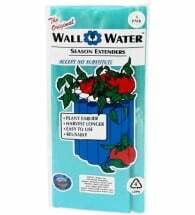 If you are a high-maintenance gardener, you may be happy starting tomatoes from seeds at various times during the spring and setting them out in succession. If so, you could work entirely with early starters which you plant and transplant at different times, so that you achieve a harvest that extends over the summer and fall. If, however, you want to do it once and be done with it, you may be happier with a variety of early to late starters that you transplant into the ground all at the same time. Disease is generally not a major problem for small producers, especially if they rotate vegetable crops. It is even less of an issue if you choose to grow one of the many varieties that has been bred to resist common plant diseases. You can find out from fellow gardeners or your local agricultural extension agent what diseases are prevalent in your area and shop accordingly. Most work on resistance has been done in the past fifty or sixty years, so if you covet disease-resistant strains, you are pretty much confined to hybrids. This is a bit like being “confined” to North America, as there are hundreds of hybrids to choose from. Enjoy your garden longer! 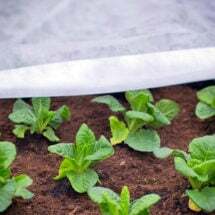 N-Sulate Frost Fabric is a medium weight, permeable, UV treated cloth designed to protect plants from frost, cold and freezing temperatures. 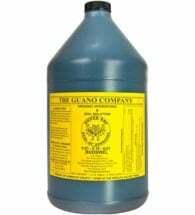 Protects tender plants by raising the temperature beneath the fabric by 6-8°F. Capitalized letters after the tomato name indicate what diseases that variety can resist. For example, a late starter called Beef Master carries the notation of “VFN,” which means it is resistant to verticillium wilt, fusarium wilt and nematodes, three of the most common problems that afflict tomatoes nation-wide. Actually, you don’t have to get into the zone, since you’re already there. What gardeners need to do is learn what zone they’re in. The US and Canada have been divided into ten zones depending on average temperatures, with 1 being the coldest, and 10 the overall hottest. These zones do a lot to indicate what will or won’t grow in a certain area, and help to standardize such information. Many plants will be designated “zone 4 & 5, ” for instance, so knowing your zone gives you a quick head start on choosing varieties. Visit the USDA’s Plant Hardiness Zone Map here. The zones, though, only take into account average temperature — not humidity, not even daily temperature range, nor rainfall. Nor do they take into account mini-zones: small areas within the larger ones on the map, with their own local conditions. If your backyard is protected by trees, shrubs, or fences, you may get more shade than you want, but your yard is also somewhat protected from winds and low temperatures. You will probably be able to put your plants out earlier and keep them bearing longer than if you’re trying to grow in a wide-open area. Moral: the more you know about your local weather conditions, the more precise your choices can be. Example: my area. All of southwest Montana is designated zone 4 on most maps, but when I go to a good local nursery, they ask “Where do you live?” because they know that Bozeman, tucked up against the mountains right at the eastern edge of our wide valley, has a more temperate climate than does Belgrade, fifteen miles west on the valley floor. In Bozeman, we get more rain than does Belgrade (five inches more per year, in fact,) and in Belgrade, temperatures are hotter when it’s hot and colder when it’s cold. Even within Bozeman, local differences can make a big difference in gardening, and the nursery workers often ask, “Right in Bozeman?” because in the older parts of town tall well-established trees provide windbreaks and hold heat as the young plantings in new developments do not. Plan on two plants per person in you live in an area with a long and warm growing season. For folks like me who live in Montana and other areas with shorter, cooler summers, you’ll actually need to plant four plants per person because each plant will produce less than it would in a more hospitable climate. Here are a couple of tips about picking out your plants. Big is not necessarily best. If the plant is tall but seems inclined to fall over, especially if the leaves are widely spaced on the stem, it is “leggy”, and may have been struggling to get enough light. Don’t buy a stressed plant. Therefore, go for leafy rather than tall. However, there should be a clearly defined main stem, not a lot of competing ones. A favorite term used by numerous experts is “stocky,” and the favored height is 6-8 inches. If you have a choice between two dark-green, bushy little seedlings, only one of which is in flower, take the other one. This runs against most people’s instincts, but the reasoning is sound. You don’t want a plant that’s in a hurry to grow up. A plant that starts producing fruit before it’s well-established can be seriously out of whack with its own growing needs. Sometimes such a plant will produce one fruit cluster and then try to go back to its vegetable childhood, and not produce another flower for weeks. Select one or two things that can function as a “bottom line,” and base your choice of varieties on these. 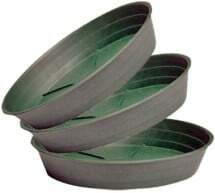 Do you have only a couple of barrels or baskets to grow them? Then the key is a variety that can grow in a confined space. Does your patio only get sun in the afternoon? You’ll need a variety that will tolerate shade. Do you have a long but cool growing season? Try one of the varieties listed on this site under Cooler Climates. Take these key points to a sympathetic, knowledgeable nurseryman, and leave with the plants he hands you. 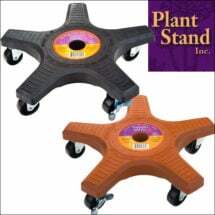 Use indoors or out to move and rotate heavy plants -- supports up to 500 lbs.